$36 and four cute as can be, easy to care for house plants. 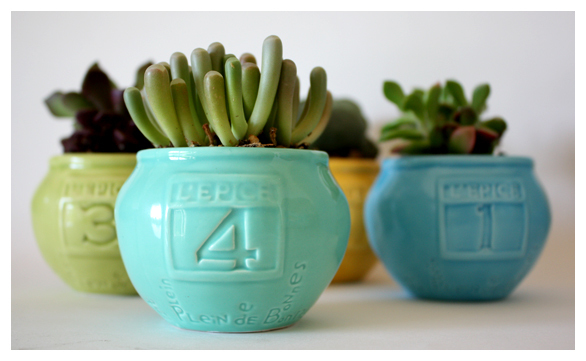 I found these colourful little spice jars ($5 each) in Anthropologie a few weeks ago and thought they would be perfect for some succulents a friend of mine had told me about. They ended up being just the right size and came in four great colours. The succulents cost me $4 each. They are sooooo easy to take care of and come in a variety of shapes, colours and sizes like the ones above. Just make sure you put them in an area that provides lots of light. What do you think? What creative ways have you come up with to house your plants?